As an extremely busy parent, I am always working on the business or planning meals or grocery shopping or running errands or... You know the drill! Thank goodness for my multi-tasking capabilities, or all would be lost! But, I realized this afternoon when my child asked me if we could spend time together, that juggling all of these daily tasks (even if done successfully), makes you lose sight of your family. And it's so ironic because 99% of the things you do all day long (and into many nights) is FOR your family. So when my daughter requested to do something with me "since we never get to do anything together", yup...you guessed it...HUGE guilt trip. I vowed to her and myself to make more time for the family that does not involved "work" or "non-fun" things. 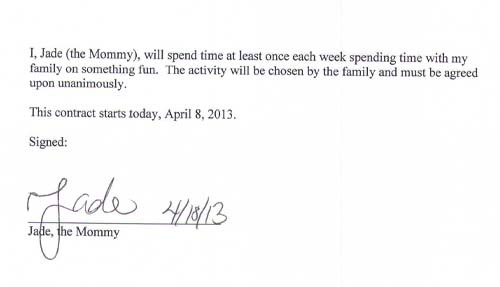 I couldn't promise her the exact days or the exact times, but I did sign a contract with her to do something special just with the family at least once a week. That's a pretty good start. Here's the contract we signed. My daughter immediately posted it to the kitchen bulletin board so Mommy couldn't forget! She is very excited that I have committed and put this in writing! If you're in the same boat as me (usually floating down guilt river), and know that you really should spend more quality time with your kids, here's a list of 10 activities you can do together to start you off. I'll post more, but for now, use these ideas to excite your family. It wouldn't hurt to come up with a contract of your own, too! Kids really love it when you make things official! 2. Take a drive to where you can really gaze at the stars clearly. In most places, even if you live in a city, you just have to go an hour or so from home to get a much better view of the night sky. Bring binoculars or a telescope if you have them. Pack a late-night snack and blanket (or lawn chairs). You're basically going to have a night-time picnic. Popcorn and juice boxes work great. Just remember to clean up any trash and look up! There are tons of smartphone apps that you can download for free to map the stars. 3. Play charades with household props. Get a roll of toilet paper, a Lego person/car/etc., a sock, a spoon, anything! Use a charades board game/cards you already may already have, or make up your own. My family just wrote down a bunch of people, places, and things on little post-it notes and used them to play. It doesn't have to be fancy! Just creating the cards was fun. You'll find that it's way more fun acting out stuff and guessing when you've got toilet paper wrapped around your head and your arm in a crew sock while pretending to fall down imaginary stairs (answer: person that fell down the stairs). 4. Dance party! Turn on music loud, it's ok! Everyone dance the night away. Perhaps have a dance contest where the winner gets a prize like a coupon to get out of a chore or a small money pot like $5. This is great exercise for everyone and it's hilarious. 5. Compose a short story together. Make up characters and create a storyline. Each person takes a turn adding on to the story. If you want to write the story down, you can illustrate it another day as a different activity to do together! 6. Make paper airplanes. This is a timeless activity that's easy, fast, and everyone likes. Make simple paper airplanes and see how far they fly. You can make it into a contest with a prize, but I prefer to measure and record distances so my daughter can practice that skill. Take the plane that did the best and pin it to the kitchen bulletin board or tape it to the refrigerator with a big "#1" written on it. It's a great reminder for the coming days of the fun you just had together! 7. Go to a park. Really, this is always a winner. You can take a long walk, stop off at a play set and play a little on the slides and monkey bars, do some of the trail activities if there are any at your park, take advantage of the boats, or just stroll around enjoying conversation. You can also use dinner games during this time, too! 8. Decorate rocks. My daughter loves doing this activity. We just go outside, find rocks, and decorate them with her arts and crafts supplies. We sometimes create animals, or paint faces, or just draw cool patterns on them. Free and super fun for the kids! 9. Build a fort/house indoors. Ah, yes, another very very popular activity for kids. They just adore building forts indoors. We use our kitchen table chairs and bar stools as supports and drape sheets over them. Inside, we lay down a thick comforter on our hardwood floor and put pillows all around. We even bring in a little LED lamp for reading together (don't use a lamp that gets hot, that will be dangerous in such close quarters). We also make sure to build it big enough to accommodate a large bean bag chair, which we both lean on while we read or draw or write notes together. My daughter usually finds all sorts of other things to decorate the fort. I let her leave it up for the rest of the week and sometimes we do part of our bedtime story in there and move the rest of the story upstairs. 10. Write and send notes to people. I LOVE this one! Everyone likes getting mail. Write notes to people in your lives telling them how much you love them, appreciate them, and why. Tell them what's going on at school, or about the new toy you just got. Or the friend's birthday party you just attended last weekend. Grandparents, uncles, aunts, cousins, neighbors...just about everyone would love to hear from you. Even siblings! Yes! Have them write each other notes, which may surprise you...they may come up with really cute ways they appreciate it other. If you don't want to write and send via traditional snail-mail, email messages are great too. They're not as much fun in my opinion, but it's better than nothing! Your family will be gifted with responses, too! Kids love to open mail! Stay tuned for more activities and ideas, I promise to make them do-able and put my spin on things!